It’s reaching an interesting point when a movie that would under normal circumstances be positioned as a prestige film, usually to be released in the fall for Oscar consideration and often with a respectable literary pedigree, is instead repurposed into a summer blockbuster. Baz Luhrmann, a director known for kineticism and bombast appears to be doing just that with his adaptation of F. Scott Fitzgerald’s scathing critique of 1920s society, The Great Gatsby. Originally scheduled for a December 2012 release, it was suddenly delayed to the current month and has been shot in 3-D, which isn’t out-of-character for Luhrman given his taste for immersive visuals but did seem odd for this particular project. It’s not beyond the possibility that it could have worked. After all, Luhrmann put himself in a similar position with Romeo + Juliet, injecting visual flash and adrenaline into the Bard’s work. He’s even reunited with the same lead actor, Leonardo DiCaprio. 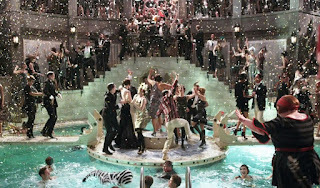 Unfortunately while Luhrmann’s style is nicely suited to capturing the wild abandon of the roaring twenties party scene, it’s not as great a fit for the emotional aspects of the story. Though since there’s never been a film that has been universally hailed as the definitive adaptation, there’s a possibility Fitzgerald’s book just isn’t well suited to the screen. The story is related through the eyes of Nick Carroway (Tobey Maguire), who comes to 1922 Manhattan to become a bond broker during Wall Street’s flush years and lives nestled among New York’s elite, which includes his old college chum Tom Buchanan (Joel Edgerton) and Tom’s wife Daisy (Carey Mulligan), who is Nick's cousin. Carroway is quickly seduced by the excess of the era’s opulence, particularly that of his neighbor, mysterious millionaire Jay Gatsby (Leonardo DiCaprio), whose palatial mansion and weekend parties are the nexus of New York’s social universe. 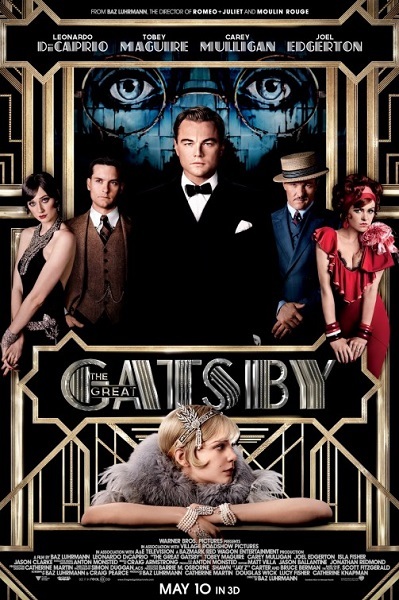 Entranced by Gatsby’s boundless energy and ingratiating manner, he allows himself to become a pawn in Gatsby’s romantic schemes regarding Daisy, with whom he hopes to resume a relationship interrupted many years before. Similar to Gatsby himself, Luhrmann excels at seducing the audience visually, creating an idealized, almost dreamlike vision of 1920s New York that is all gleaming metal, polished marble and crisp fabric, a triumph of production and costume design. Everything is heightened and just slightly artificial, suggesting Carroway’s rose-tinted remembrances of the period and giving the setting a melancholy undertone since the stock market crash and resulting depression loom over all the fun. His camerawork is a bit less frenetic as compared to some of his previous films, with the most dynamic stuff saved for the chaotic parties and sweeping, effects-enhanced pullbacks that isolate characters within their sumptuous homes and surroundings. I actually ended up seeing this in two-dimensions but am tempted to see it again in 3-D just to see how it all translates. Unfortunately the visuals don’t work very well in conjunction with the screenplay, which uses large chunks of the original text of the book, narrated by Carroway in the first person, by including a framing device in which Carroway is writing his story in an asylum. Rather than follow the old filmmaking axiom of “show, don’t tell,” Luhrmann opts for both, to the point where some of the narration is both spoken and printed onscreen. The problem is best illustrated by his depiction of some of the novel’s most famous iconography: the green light on the dock of Daisy’s home that Gatsby fixates on, the old optometrist billboard with its god-like stare watching over the proceedings, the shrill ring of the telephone that always seems to bring conflict between the characters, etc. In prose, Fitzgerald linguistically opines on the psychological and philosophical significance these objects hold because words are all he has. Luhrmann never seems to have confidence that his visuals can convey these ideas on their own. After the sugar rush of the party scenes, the whole pace of the film becomes sharply languid and the character relationships never quite gel. One of the book and film’s emotional highpoints is a tense hotel room showdown with all the participants, with all the emotions of the love triangle finally brought into the light. As played here, this pivotal moment in particular seems oddly and disappointingly inert. 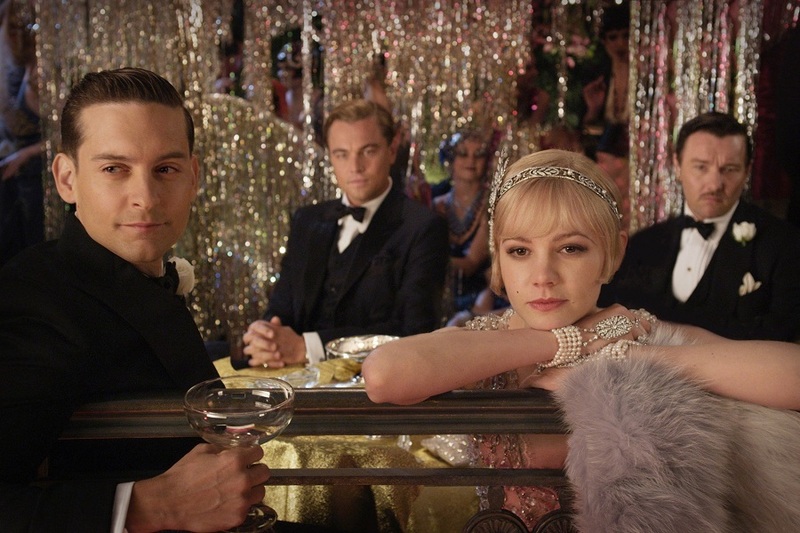 The grand emotions of Daisy and Gatsby's relationship feel as gaudy but insubstantial as Gatsby's party streamers. Another element of the book that seems to fail in movie form is our narrator Carroway. While Maguire is suitably wide-eyed in the part, on the printed page Nick is mostly there to give us a portal into the story, to allow us to witness the events involving Gatsby and Daisy. Once he’s a character in a movie, the passive quality of him that works fine in the book becomes problematic, particularly since we’re somewhat distanced from the more active and interesting characters of the story. It’s also worth noting that the suggestions of his bisexuality hinted at in the book seem to be totally absent here. This brings us to Gatsby himself. DiCaprio’s perpetually youthful appearance can sometimes make him seem ill-fitting for some roles, through no fault of his own. Here it meshes perfectly with the total discontinuity of his mysterious millionaire. He’s effectively dapper and charismatic and we completely accept that this quixotic figure could pull everyone nearby into his orbit. 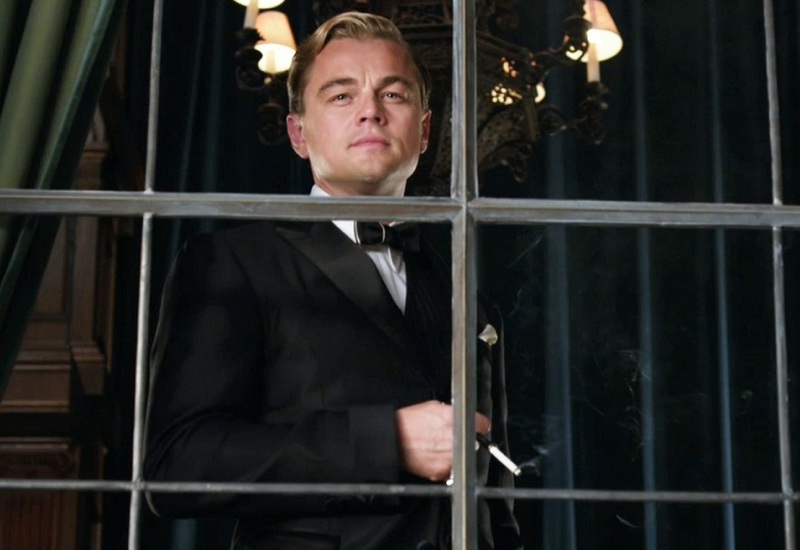 The element that DiCaprio uncharacteristically has trouble with, besides his slightly dodgy accent, is depicting the real darkness of Gatsby’s obsession and the romantic madness that informs Gatsby’s every extravagant act. We get it a taste of it briefly during that hotel room confrontation with Tom but by then it's too little too late. The talented Carey Mulligan seems an odd choice for Daisy, one of the most vilified characters in American literature due to her perceived shallowness and self-absorption. Mulligan’s inherently sad beauty, which always makes her seem one harsh comment away from bursting into tears, suggest more tragic layers to Daisy and paint her as a woman trapped in an untenable situation between two ego-driven men. This does open up the possibility that Luhrmann is deliberately painting Carroway as an unreliable narrator. Just as he lionizes Gatsby for his unceasing (and highly unhealthy) optimism, he condemns Daisy and Tom for their actions, suggesting Daisy’s bad reputation is more a reflection of Carroway’s skewed viewpoint. Joel Edgerton, one of the those actors who feels like he’s just one good part away from really breaking out, is suitably brutish as Tom, perhaps to the story’s detriment since it becomes harder to believe Daisy could have had any real affection for him. Isla Fisher’s part as Myrtle, Tom’s mistress, feels like more of an extended cameo and the character barely has a chance to make an impression. One actress who does impress is relative newcomer Elizabeth Debicki as Daisy’s pal Jordan Baker. With vampishly seductive looks and an enthusiasm for gossipy drama, she beautifully embodies the facile pleasures of the period. If Luhrmann intended for the audience takeaway to be one of flash triumphing over substance, of beautiful surfaces concealing empty interiors, he may have succeeded a bit better than he intended. His Gatsby is an intoxicating ride in many ways and its fidelity to the book will no doubt be a boon to high school students who fear the printed page, but it seems the prospect of a totally successful adaptation of the book continues to tease us like a green light in the fog.